What’s the Difference Between Regular Running Shoes and Trail Shoes? | So What? I run. What’s the Difference Between Regular Running Shoes and Trail Shoes? Believe it or not, I really had a hard time finding a lot of information in comparing regular running shoes and trail shoes. 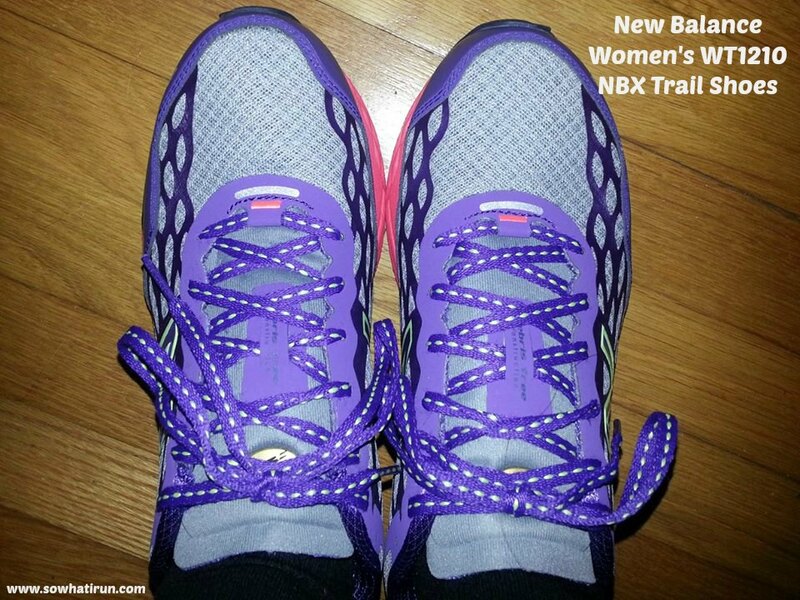 When I was fitted for my trail shoes, I asked Coach Marie, what’s the difference? I also noticed that people debated on whether or not you really needed trail running shoes. Being a first time trail runner and having worn my regular running shoes on the rocky, rooty, trails, I say YES! If you are running on trails with rocks, roots, a lot of elevation changes, get trail shoes! If you are simply sticking to a dirt trail, I think it’s fine to wear your regular shoes. Now before I go into the technical stuff on comparing material, design, etc of the different shoes, I want to tell you my experience. 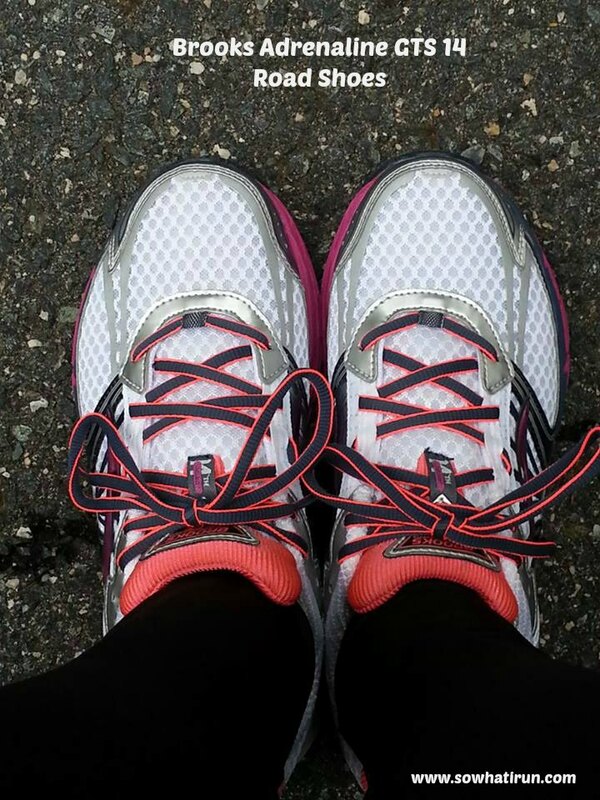 Saturday was the first official trail training run and I wore my new trail shoes for the first time. Twice before, I went out on the trails with my regular running shoes just to see what trails were all about. When I went out with my regular shoes, I noticed that I rolled my ankles more and that I was “on top” of the ground, rocks, and roots. I found that I felt a little unstable…well more than usual because I’m clumsy, and I really had to work to get my footing. Frankly, I was running as if I were giving a Broadway performance. I’d run then all of the sudden my arms flailed out, then I’d take two steps and arms flailed out again. Step, step, FLAIL! Step, step FLAIL! <sigh> I digress. But, last Saturday when I ran in my trail shoes, I could feel a significant difference. I felt more stable, as much as I possibly could for me, and I felt that I was gripping the ground better. My ankles didn’t roll as much (no matter what, your ankles will roll on the trail from time to time), and I felt that I didn’t feel “on top” of the terrain. In both instances, I slipped in mud. Mud is slippy, what can I say. 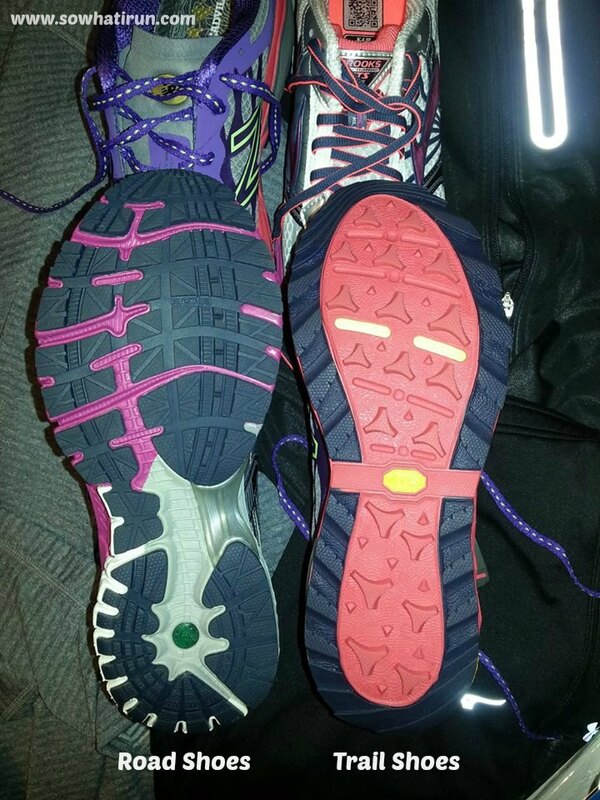 Below is a comparison between the two shoes. I have the Brooks Adreneline GTS 14 road shoes and New Balance WT1210 trail shoes. The following was taken from an article I found, Trial Running Shoes 101. 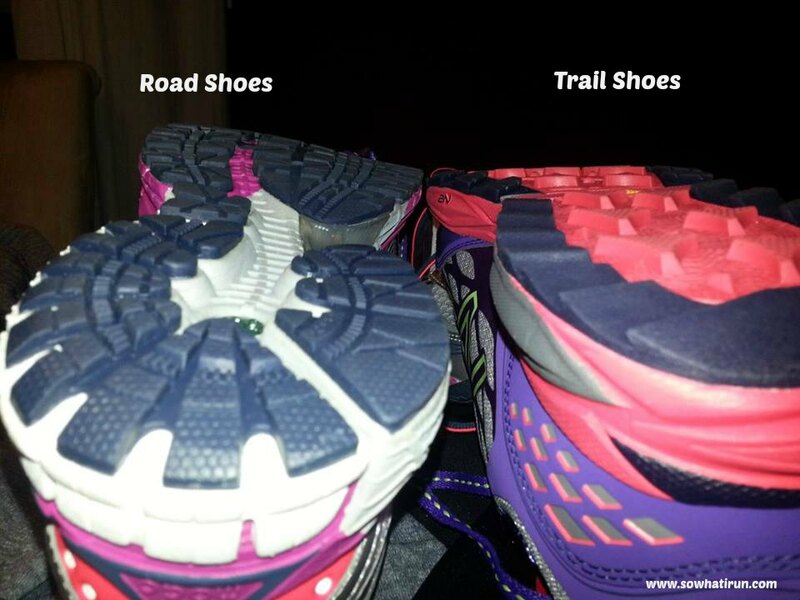 The main difference between road shoes and trail shoes is their composition. Shoes designed for road running are generally made of lightweight material to encourage speed and responsiveness. The need for traction on paved roads is minimal, so the treads of road shoes are thin. The soles of trail shoes are wide and close to the ground to provide support on uneven surfaces, preventing the ankle from twisting when the foot comes down on bumps or rocks on the trail. I understand that there are several different types of trail shoes such as hybrid trail shoes, which are designed for both road and flat trails that are pretty flat, and minimalist trail shoes, which mimic barefoot running. But for what I’m training for, I’ll stick with the conventional trail shoes. If you have anything to add, please feel free to comment! This is all new to me, so any additional feedback on the difference between regular running shoes and trail shoes are appreciated! This entry was posted in HAT 50K Training, Trail Running and tagged Athletic shoe, Footwear, Road Running, Shoe, Trail, Trail Running by SoWhatIRun. Bookmark the permalink. For my first pair of trail shoes, I purposely selected a pair with an aggressively lugged sole, almost cleats; the trails I run on feature a great deal of steep, muddy inclines and downhills; and these were also recommended for the obstacle racing I will be doing in the spring. I will be doing a review of my own in a few weeks, be watching for it! I don’t run REAL rough trails often (but we do hike them)…I have wondered if I should be using different shoes on the treadmill versus the much easier trails near our place that we do run though. You know…I’m sure hiking shoes would make a big difference with traction. I was very impressed when I switched to trail shoes for the trails. I have both these same shoes! Trail shoes are much better on trails then road shoes. I think its important to have the right shoe for the terrain! That is so funny! Agreed! What I found in the differences is mostly in the materials of the upper used. Where the trail shoes are more durable and with material that are more water/ dirt repellent-ability. The road shoes have a much vibrant color schemes/designs.